The countryside of Tuscany has a timelessness about it, ancient stone terraces of olive and vines, chestnut trees intermingled with walled medieval villages, castles, forests, and wonderful vineyards. Certainly one of the best ways to explore this part of Italy is on a bike. From Pisa, with its imposing tower and its magnificent churches, you start cycling along the so called Via Francigena, an ancient road where people used in order to visit the holy city of Rome. Following the steps of these medieval pilgrims, you will go through extraordinary places in the middle of rolling hills, scattered with castles, fortresses and abbeys. After crossing San Miniato, a place much beloved by Emperors and Popes, located in the Arno Valley, you will finally reach Siena, with its wonderful square. Savour the pleasure of pedaling through the vineyards of Tuscany and Chianti. Taste the fine wine and sample the excellent Italian cuisine of this region. 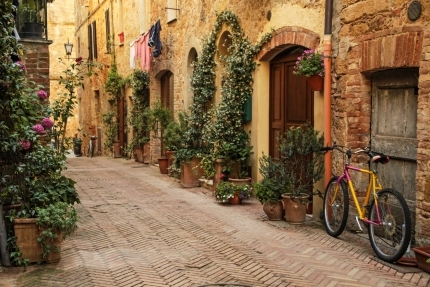 Uncover the beauty and charm of Tuscany!